Ionia, Magnesia on the Maeander (c. 160-150 B.C. 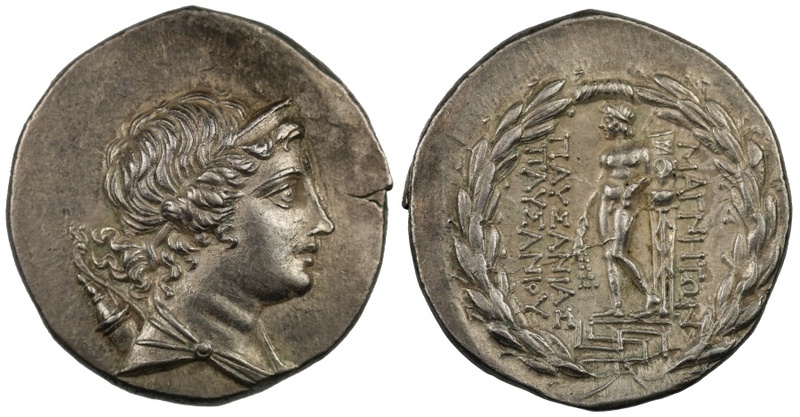 ), Silver Tetradrachm. Magistrate Pausanias. Diademed and draped bust of Artemis facing right, a bow and quiver over her shoulder, rev. MAΓNHTΩN / ΠAYΣANIAΣ / ΠAYΣANIOY, Apollo Delphios standing facing, head turned to left, holding a branch tied with fillet and leaning against a tall tripod on right, meander pattern below; all within a laurel-wreath, 16.85g., 12h (N. Jones, 'The Autonomous Wreathed Tetradrachms of Magnesia on Maeander', ANS MN 24, 1979, 13/1; SNG Lockett 2830 (these dies)). Lightly toned, extremely fine and attractive.